James C. Scott teaches political science and anthropology at Yale. He’s a smooth writer and a deep thinker. A while back, he decided to update two lectures on agrarian societies that he had been giving for 20 years. He began studying recent research and — gasp! — realized that significant portions of traditional textbook history had the strong odor of moldy cultural myths. So, a quick update project turned into five years, and resulted in a manuscript that I found to be remarkably stimulating, from cover to cover — Against the Grain: A Deep History of the Earliest States. While the human saga is several million years old, and Homo sapiens appeared on the stage maybe 200,000 years ago, the origin myth I was taught began just 10,000 years ago, with domestication and civilization. We were transformed from hungry, dirty, dolts into brilliant philosophers, scientists, and artists, who lived indoors, wore cool clothes, and owned lots of slaves. As a curious animal interested in ecological sustainability, I’m amazed that every other animal species has, for millions of years, lived on this planet without destabilizing the climate, spurring mass extinctions, poisoning everything, and generally beating the <bleep> out of the planet. These are the unintended consequences of our reckless joyride in a hotrod of turbocharged progress. They define the primary aspects of a new geological epoch, the Anthropocene, the era when tropical primates with huge throbbing brains left permanent scars on the planet. Experts argue about when the Anthropocene began. Did it start with the sorcery of nuclear fission, or the curse of fossil-powered industry? Many point to the domestication of plants and animals, and the birth of civilization. Scott is among the few who say it began with the domestication of fire, which occurred at least 400,000 years ago, sparked by our Homo erectus ancestors. Every other species continues to survive via the original power source, the sun’s wildfire. Plants grow green solar panels that produce the nutrients that keep the fauna alive and happy, a perfectly brilliant design. Imagine waving a magic wand, and eliminating everything in the world made possible by domesticated fire — no metal, no concrete, no plastic, no glowing screens. Would humans still be around? 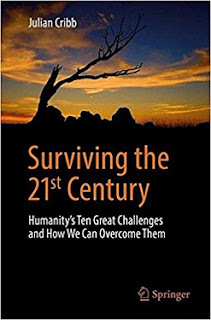 Fire historian Stephen Pyne concluded, “Without fire humanity sinks to a status of near helplessness.” We wouldn’t be able to survive outside the tropics. The plant and animal species that enabled civilization lived north of the tropics (see THIS). Without domesticated fire, we’d still be wild and free — and far less crowded. The moldy myths imply that domesticated plants and animals, sedentary communities, and fixed-field agriculture emerged in a close sequence. Wrong! There is scattered evidence of sedentary hunter-gatherers by 12,000 B.C. Domestication began around 9000 B.C. It took at least four thousand years (160 generations!) before agricultural villages appeared, and then another two thousand years before the first states emerged, around 3100 B.C. Moldy myths assume that the Fertile Crescent has been a desert since humans first arrived. Wrong! Southern Mesopotamia used to be wetlands, a cornucopia of wild foods, a paradise for hunters and gatherers. There was so much to eat that it was possible to quit wandering and live in settled communities. “Edible plants included club rush, cattails, water lily, and bulrush. They ate tortoises, fish, mollusks, crustaceans, birds, waterfowl, small mammals, and migrating gazelles.” In a land of abundance, it would have been absolutely stupid to pursue the backbreaking drudgery of agriculture. Moldy myths often give us the “backs-to-the-wall” explanation for the shift to agriculture, which was far more work. Simply, we had run out of new alternatives for feeding a growing mob, while hunting was producing less meat, and wild plants were producing less food. We had no choice! But in the Middle East, there appears to be no firm evidence associating early cultivation with the decline of either game animals or forage. Cultivation seems to have emerged in regions of abundance, not scarcity. Every year, floods deposited silt along the riverbanks, moist fertile soil ready for sowing. So, flood-retreat farming would have required far less toil than tilling fields, while producing useful nutrients. More nutrients enabled further population growth, which eventually pressed the shift to miserable labor-intensive irrigated agriculture. Domesticated sheep have brains 24 percent smaller than their wild ancestors. Pig brains are a third smaller. Protected from predators, regularly fed, with restricted freedom of movement, they became less alert, less anxious, less aggressive — pudgy passive dimwit meatballs. They reached reproductive age sooner, and produced far more offspring. “The multispecies resettlement camp was, then, not only a historic assemblage of mammals in numbers and proximity never previously known, but it was also an assembly of all the bacteria, protozoa, helminthes, and viruses that fed on them.” The domus was a magnet for uninvited guests: fleas, ticks, leeches, mosquitoes, lice, and mites. Unnatural crowds of animals spent their lives walking around in poop, and drinking dirty water. It was a devilishly brilliant incubator for infectious diseases. Humans share a large number of diseases with other domus animals, including poultry (26), rats and mice (32), horses (35), pigs (42), sheep and goats (46), cattle (50), and dogs (65). Other writers have noted that, prior to contact, Native Americans had no epidemic diseases. With very few domesticated animals, they lacked state of the art disease incubators. Scott goes one step further, asserting that prior to the domus, there was little or no epidemic disease in the Old World. “The importance of sedentism and the crowding it allowed can hardly be overestimated. It means that virtually all the infectious diseases due to microorganisms specifically adapted to Homo sapiens came into existence only in the past ten thousand years, many of them perhaps only in the past five thousand.” Thus, the humans that first crossed from Siberia to North America 13,000 years ago were free of disease because little or no infectious disease existed anywhere in the world! Dense monocultures of plants also begged for trouble. “Crops not only are threatened, as are humans, with bacterial, fungal, and viral diseases, but they face a host of predators large and small — snails, slugs, insects, birds, rodents, and other mammals, as well as a large variety of evolving weeds that compete with the cultivar for nutrition, water, light, and space.” Once harvested and stored in the granary, grain could be lost to weevils, rodents, and fungi. 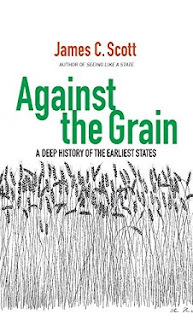 The biggest vulnerability of states was that they were almost entirely dependent on a single annual harvest of one or two staple grains. Crops could be wiped out by drought, flood, pests, storm damage, or crop diseases. Mesopotamian life was largely human powered. Workers grew the grain that the tax man hauled away to the plump elites. More workers meant more wealth and power for the big shots. In screw-brained hierarchical cultures (including ours), it’s impossible to have too much wealth. Therefore, peasants and slaves were husbanded like livestock. The diabolical “more is better” disease was devastating. Some believe that monumental walls were built as much for defense as to prevent taxpayers and slaves from escaping to freedom. Early states were vulnerable in many ways, and they frequently collapsed. Collapse sounds like a tragedy. But it could simply mean breaking up into smaller components. Larger was not necessarily better. A drought might cause a state’s population to disperse. For the non-elites, life in a Mesopotamian state could be oppressive and miserable. Sometimes, collapse was a cause for celebration. Yippee! Anyway, the book is fascinating. Readers also learn about the tax game, the vital slave industry, trade networks, deforestation, erosion, soil salinization, irrigation, looting and raiding, mass escapes of workers, the challenges and benefits of being surrounded by large numbers of aggressive nomadic herders, and on and on. It’s an outstanding book! WARNING: The expensive Kindle edition contains numerous charts, maps, and diagrams. When downloaded to the Kindle for PC application (v 1.20.1), most are unreadably small, even on a 24” monitor. Clever nerds can tediously capture the images to another application, expand them, and read them. Strong reading glasses (3.75 lens or higher) also work with a big monitor. Scott, James C., Against the Grain: A Deep History of the Earliest States, Yale University Press, New Haven, 2017. Four Domestications is a free PDF download, the 48-page text of a lecture Scott gave at Harvard. It includes some of the foundation ideas for his new book. Seeing Like a State is a free PDF download of Scott’s 1998 book, a companion for his new book.